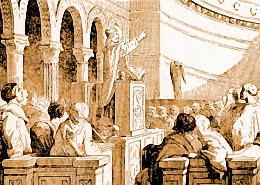 ST. BARBATUS was born in the territory of Benevento in Italy, toward the end of the pontificate of St. Gregory the Great, in the beginning of the seventh century. His parents gave him a Christian education, and Barbatus in his youth laid the foundation of that eminent sanctity which recommends him to our veneration. The innocence, simplicity, and purity of his manners, and his extraordinary progress in all virtues, qualified him for the service of the altar, to which he was assumed by taking Holy Orders as soon as the canons of the Church would allow it. He was immediately employed by his bishop in preaching, for which he had an extraordinary talent, and, after some time, made curate of St. Basil's in Morcona, a town near Benevento. His parishioners were steeled in their irregularities, and they treated him as a disturber of their peace, and persecuted him with the utmost violence. Finding their malice conquered by his patience and humility, and his character shining still more bright, they had recourse to slanders, in which their virulence and success were such that he was obliged to withdraw his charitable endeavors among them. Barbatus returned to Benevento, where he was received with joy. When St. Barbatus entered upon his ministry in that city, the Christians themselves retained many idolatrous superstitions, which even their duke, Prince Romuald, authorized by his example, though son of Grimoald, King of the Lombards, who had edified all Italy by his conversion. They expressed a religious veneration for a golden viper, and prostrated themselves before it; they also paid superstitious honor to a tree, on which they hung the skin of a wild beast; and those ceremonies were closed by public games, in which the skin served for a mark at which bowmen shot arrows over their shoulders. St. Barbatus preached zealously against these abuses, and at length he roused the attention of the people by foretelling the distress of their city, and the calamities which it was to suffer from the army of the Emperor Constans, who, landing soon after in Italy, laid siege to Benevento. Ildebrand, Bishop of Benevento, dying during the siege, after the public tranquillity was restored St. Barbatus was consecrated bishop on the 10th of March, 663. Barbatus, being invested with the episcopal character, pursued and completed the good work which he had so happily begun, and destroyed every trace of superstition in the whole state. In the year 680 he assisted in a council held by Pope Agatho at Rome, and the year following in the Sixth General Council held at Constantinople against the Monothelites. He did not long survive this great assembly, for he died on the 29th of February, 682, being about seventy years old, almost nineteen of which he had spent in the episcopal chair. Reflection.--St. Augustine says: "When the enemy has been cast out of your hearts, renounce him, not only in word, but in work; not only by the sound of the lips, but in every act of your life."